Shirt: J. Crew, Skirt: J. Crew (similar), Belt: J. Crew, Shoes: Steve Madden (similar), Sunnies: Marc by Marc Jacobs, Clutch: Asos, Earrings: Forever 21, Necklace: J. Crew, Bracelets: J. Crew, Michael Kors (similar), Rings: Asos, Nails: China Glaze-Voltage Pink & Revlon-Green with Envy, Lips: MAC Pink Poodle + Lovelorn. Cuteness! I ordered that necklace after seeing you wear it! I really want your skirt! I need those in all colors for work! Adorable! I WANT that necklace! Wonderful outfit!! You look beautiful, Hun! I love everything about this. 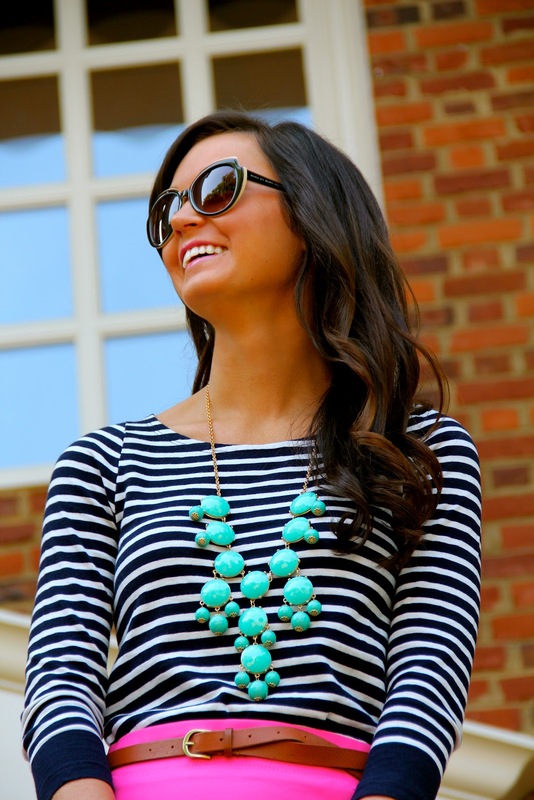 the stripes are great with the bright pink and that necklace is a gorgeous addition. Love how you put the colors together! That necklace goes so well with this whole look. You look like Pippa Middleton, I almost thought you were her for a minute. Wow love this outfit!! 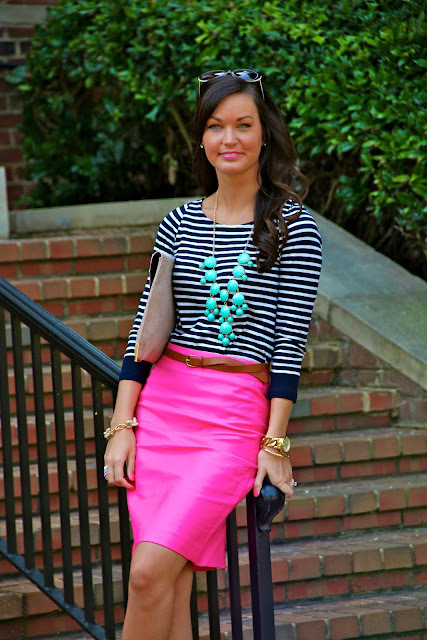 The pink, stripes, and turquoise are perfect together! your gorgeous! love this outfit and the colors put together! Great look! I love this necklace...it is actually going to be my next giveaway sponsored by Fab'rik! Thanks so much for entering my Coral Necklace giveaway!